Arizona’s Primary election is fast approaching. This coming Tuesday, August 26th, is the date Arizona voters will decide who the candidates will be going in to the 2014 General election. Early ballots are out and, if you have one, please remember to fill it out and mail it in today. Not yet registered to vote or not sure of your voting status? You have till October 6th to register to vote in this years General election and both registering and correcting your registration is easy. Just go to http://servicearizona.com/ and click on the “Voter Registration” button. Are you registered to vote but maybe moved since you registered? You’ll need to update your registration for your vote to count. One of the things most commonly heard about voting these days seems to be “why bother voting? My vote doesn’t matter anyway”. This statement couldn’t be farther from the truth. Because more people don’t vote in Arizona we have 1062, 1070, attacks on ethnic studies, attacks on women’s health rights, attacks on the poor, attacks on our educational system and attacks on migrants. Those who don’t vote are the reason Arizona remains a “Red” state that continues to pop up on “The Family Guy” and “Jon Stewart” in negative ways. Why should you vote? 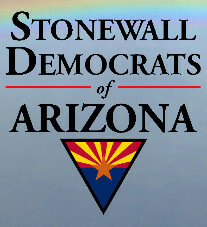 If Arizona elects just two more Democrats to the State Senate we’ll have a tie, 15 Democrats, 15 Republicans. Imagine for a moment an Arizona with a Democratic Governor, Secretary of State and Attorney General PLUS Democrats holding 50% of the Senate. 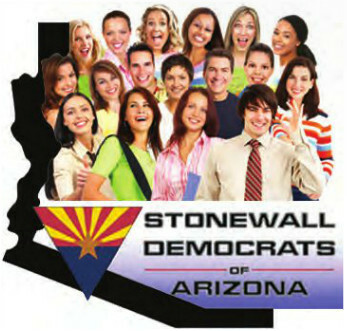 Arizona may not turn into a “Blue” state -- not yet anyway, but it will be a far more level playing field in regards equality and basic human rights. One more thing to consider: if Alfred Kinsey, developer of the “Kinsey Scale” was correct, there are over 100,000 LGBT people in Arizona. What would happen if even half of us were not only registered but also voted? That's 50,000 LGBT votes -- votes for equality -- added into the mix!